A lot goes into holiday decorations in a college dorm room. You want your dorm room decor to have a lot of impact and mostly you want your holiday dorm room decorations to make your college dorm room feel like a home away from home. Your holiday dorm room decorating will start with your Christmas tree, which makes your dorm Christmas tree pretty important. However, the dorm room decorations you place on the branches are just as important if not more important than your Christmas tree. Placing the perfect dorm room decorations on the branches of your dorm Christmas tree is what fills out your tree and makes it an even more comfortable addition to your dorm room decor. Garland is the dorm essentials item that will unite all of your holiday decorations for your Christmas tree and provide a pretty backdrop to your dorm decorating theme. 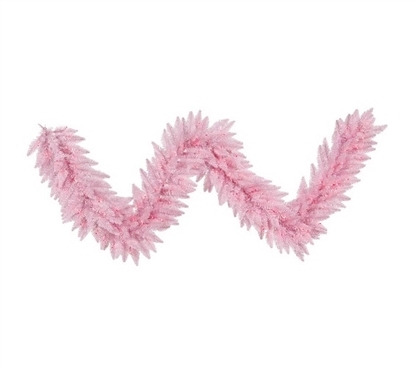 Our Pink Garland with Mini Lights has a soft, pretty color like cotton candy that will make your college dorm room feel like a winter wonderland. Wrapped through the garland strand are pink mini dorm lights on pink wire that will allow you to add to dorm essentials to your college Christmas tree at the same time. Complete your holiday dorm room decor and make your dorm Christmas tree look amazing with our Pink Garland with Pink Mini Lights!